This is Zain’s recipe for the traditional Bahraini Saloonah that she shared with me as we talked about Ramadan in Bahrain (post on this link). 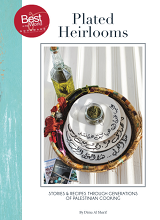 She and her family love this saloonah and it is a staple Ramadan table option. Give it a try and see how you like it. Sprinkle some cinnamon, salt and pepper on the beef. Heat the oil in a large pot. Carefully place the seasoned beef in the pot and sear it on all sides. Once slightly browned, remove the beef and set aside. In the same pot, fry the coriander powder to initiate the flavor. Then fry the onion until soft, follow by the tomato paste and stir to incorporate. Pour in half the vegetable broth and mix. Bring to a simmer and add turmeric, potatoes, summer squash, carrots and beef. Cover and simmer for an hour. Keep stirring every once in a while. Once the meat starts to soften, add the chopped tomatoes and zucchinis. Cover and continue to simmer gently. Add the okra and coriander, then season with salt and pepper as you see fit. Continue to simmer, keeping an eye on the meat. Once the meat is very tender remove and serve. Gently remove all vegetables and meat into a separate dish reserving the stew liquid. Add the bread to the stew liquid and mix until incorporated. If you added too much bread add a bit of water to regain liquidity. Gently add half the vegetables. To serve, pour the soaked bread and stew liquid into a serving bowl, top with the remaining vegetables and meat. Mom’s tips: Mash some of the soft potatoes or squash to thicken the Saloona. The thicker the better. Saloona keeps well in the fridge for up to 3 days and actually tastes better the next day. To reheat, do not use the microwave, instead pop it on the stove and reheat it thoroughly. This saloona recipe is provided by Zain and is her property. They are published on this blog with her permission. Please do not copy without her permission.